I know I can keep running. I’ve encouraged so many pregnant women to continue working out and jogging through their pregnancy, especially the first trimester. So now that I’ve made it through my first month why can’t I get myself to run. It’s mental. It’s a fear inside of me that previous women have told me about. A fear of knocking the newly implanted baby loose, about over exerting and somehow causing something to go wrong. It’s picturing a tiny baby holding on as you jostle him from side to side in search of your 60 minutes of runners high. I’m walking at least 4 miles everyday. I’m still moving, but I want to run again, I miss it. Quick side note: Pregnancy is not the time to start a running routine. If you didn’t previous run, start by walking – work up to an increased speed and longer distances, but don’t jump right into running. Talk with your doctor about your fitness plan and what to be aware of for your specific body. There are two things pregnant women should be cautious of: Overheating and Falling. 1. Drink A Lot of Water – Bring water with you and drink more water than you think you need. 2. Wear Good Shoes – With the extra baby weight your joints will be feeling the run more than ever. You want your ankles and arches supported. 3. Get a Good Sports Bra – Your breasts have most likely grown at least a cup size by now, make sure you have good support before you go out for a run. Without a good sports bra, it won’t be comfortable to run. 4. Run on Flat Surfaces – Especially in the later months of pregnancy your center of gravity is thrown off which increases your risk of falling and messes with your balance. By running on flat surfaces you reduce your risk of falling and harming the baby. 5. Listen to your body – If your heart is racing out of control, slow down. If you can talk while running, slow down. If you get a headache, bleeding or feel dizzy – take the day off from working out. Your body will tell you what it needs, you just have to listen! 6. Never run to the point of exhaustion – You should always be able to talk during your workouts. During pregnancy you need to be careful not to overheat your body. Take your normal workouts down a notch and dont lift weights to failure. 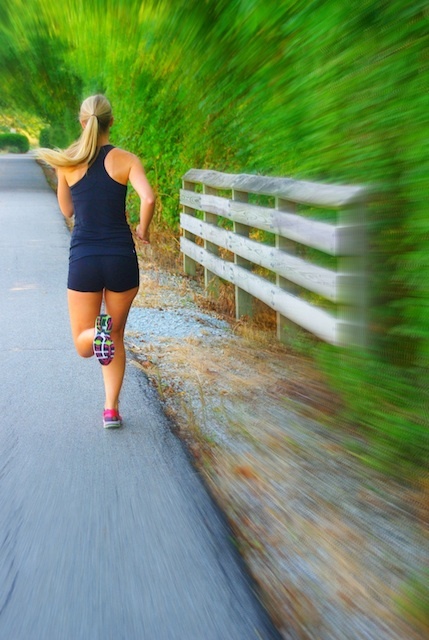 How has running during your pregnancy gone? Any Tips you would add to my list?